Paysannes et Vaches Devant Le Village de Mont-Saint-Père stands as L'Hermitte's bucolic tribute to the town in which he was born. 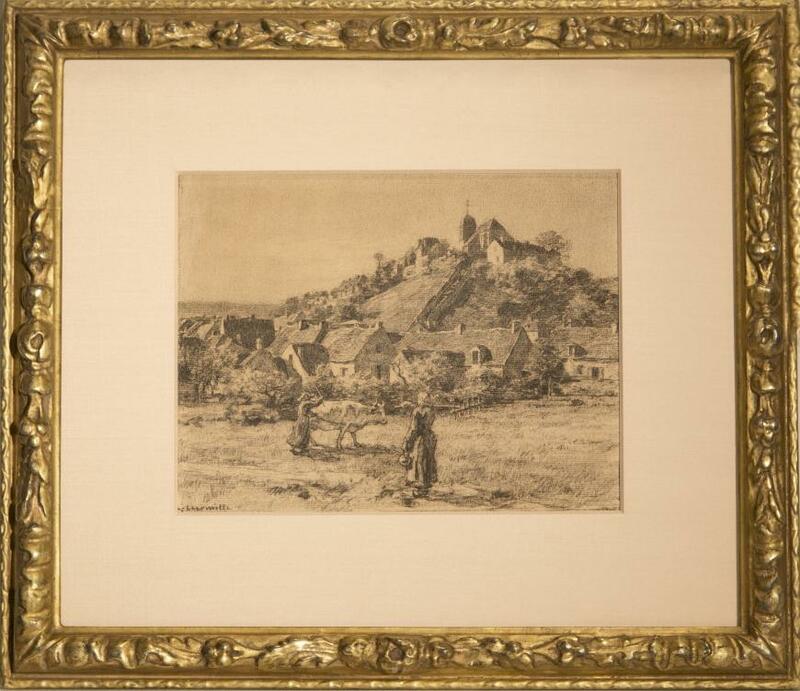 This charcoal is related to the 1888 book 'La Vie Rustique' ('Rustic Life') by Andre Theuriet, for which L'Hermitte produced the illustrations, and it appears on p. 193. Theuriet was a novelist noted for his simple, pastoral depictions of provincial country life, and he received the prix Vitet from the Academie Française in 1890, just two years after 'La Vie Rustique' was published. L'Hermitte, already noted for his superior work on paper in both pastel and charcoal, was selected to illustrate the novel, and provided plates for each of its chapters as well as the cover page and frontispiece. 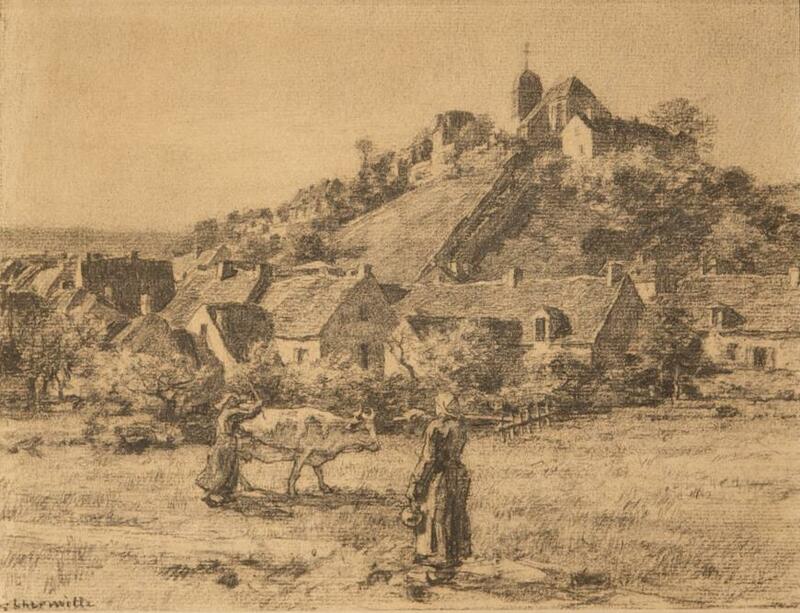 Paysannes et Vaches in particular depicts the village of Mont-Saint-Père in the Northern French province of Aisne, and it is a preparatory sketch for the image opening the chapter in the novel entitled The Village. In the scene, two peasant farmers and their cow stand in a field on the outskirts of town, surrounded by small, modest homes and a church atop a hill in the background. Paysannes et Vaches captures the essence of provincial life, with its emphasis on simple yet challenging work and the diligent, pious, and family-oriented lifestyle with which it is associated. Mr Hamel, A French Artist: Leon L'hermitte (1844-1925), doctoral thesis, Saint Louis, Washington University, 1974, C 124, no. 121, repr.